Styled with quillian pant . A slinky camisole to wear a million different ways. This camisole is tailored with fluid, easy-care fabric that stays polished morning to night. Loved thisso much, needed another color. Now I have both white and black. Very versatile cami, can be dressed up or down. I ordered the purple and the color is beautiful. I made the mistake of ordering a size down based on some reviewer comments, but for my body it was a mistake (usually a medium - ordered a small). It is now too tight across the chest. Recommend ordering your size or even up, as it is a little heavier and more structured than it seems based on the photos. The straps are adjustable which is a plus. Got this in-store in the mauve earth colour today. It is such a flattering shape, it can be dressed up or down. I will likely be purchasing this in white and black as well as it is such a versatile piece. The adjustable straps are such a bonus, you can tweak the length and depth of the neckline depending on what bra you are wearing or where you are going. I wear it with everything, under everything. I own a few colours and two in black. I have the Evelyn camisole in 8 colours. They are so versatile, you can wear with dress pants, jeans, under a blazer or with a skirt or shorts, they go with everything and a must have staple in your closet! Love the material and the cut with adjustable straps. A must have in every closet. I have this camisole in many different colours. It is by far my favourite and incredibly versatile. I am normally a small in aritzia tops but I always order an xs in the everly because I like a tighter fit. Must have, classic, staple piece. Love the Everly cami - fits perfectly under a blazer or a jacket. Have purchased it in three different colors to mix and match. 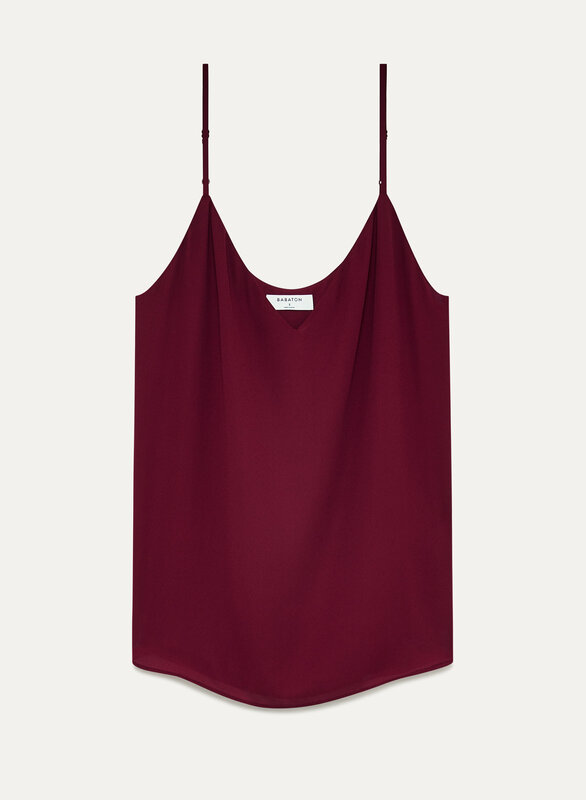 I have this camisole in two different colours and I wear both of them all the time. The fabric and the neckline make it so flattering, and it's so easy to dress up or dress down. It does fit a bit loose which can make the "V" neckline go down a little low, so I would suggest sizing down if you don't want to show too much chest.